Original paintings will be sold framed or unframed, at the buyers' choice. Unframed original paintings can be rolled and mailed in a mailing tube. Seller will pay first $50 of shipping to all countries outside the US and US Virgin Islands. Seller will pay all shipping costs within the US and US Virgin Islands. I was traveling along winding country roads one late winter's afternoon. As the sun was setting off to the right, these barns caught the last rays of the sun. I was able to quickly work up a good sketch with color notes there and bring "Winter Fields" to life later in the studio. The ending to a great day of painting. Signed, numbered, limited edition print of 350. 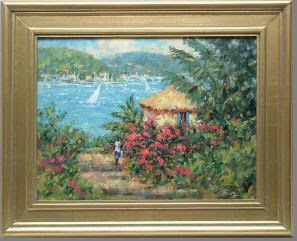 Image size: 10 1/2" x 21 1/2"
For those of you who enjoy the tradition of open-air impressionist paintings, my work holds great appeal. These paintings are distinguished by the varried brush strokes and rich color. For me, the essence of the painting begins on the scene. I will use either oil, watercolor, gouache, or pencil, as long as I record what excited me about the scene. I like to focus on surprises, the unexpected, an object of beauty that has been overlooked. For me it's always refreshing to get a different perspective about painting. As a result, I enjoy seeing the work of other artists, Over the years, I have studied with a few of the best: Tom Lynch, watercolor Nite Engle, watercolor Scott Christensen, oil, landscape Jim Wilcox, oil, landscape Daniel Gerhartz, oil, figure and portrait Matt Smith, oil, landscape. Each of these artists have given freely of their knowledge. Each have helped me grow as an artist and their outlook on life and living in a creative world has contributed to my growth personally. I continue to refer their ideas and the many notes I've taken.